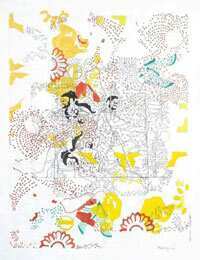 In Delhi-based artist Arjuna’s Mahalaxmi serigraphs, the Hindu Goddess of wealth is all jazzed up. The rainbow—coloured 12"x 9" serigraphs have danseuse Geeta Chandran pose as Laxmi—the Goddess who rises to special prominence during the festival of Diwali. These serigraphs were part of the ‘Festival of Lights’ exhibition at the Alliance Francaise de Delhi in November 2007 that was curated by Himanshu Verma of Red Earth. Encouraged by the response to these quirky serigraphs, Verma decided to bring them back this festive season, along with several other new Diwali-themed art work. Art lovers can also buy a sculpture by artist Gagan Vij, 36 candle bridge, which recreates the bridge that Rama’s crossed complete with his khadaaun (slippers) symbolically standing in for him. Both I see myself as Laxmi and 36 candle bridge are available in multiple editions and could make for interesting Diwali gifts. The ‘Art for Diwali 2009’ launched online earlier this week and will have around 30 Diwali-themed artworks on exhibit online. The range is priced affordably between Rs2800 and Rs15000 with some pieces going up to Rs3,00,000.